CAMP SEC. RUPERTO K. KANGLEON, Palo, Leyte – The Regional Special Operations Group 8 (RSOG8) of the Police Regional Office 8 arrested 6 persons, including a minor, in a series of anti-illegal gambling operations in different parts of the region recently. “These accomplishments showed our firm commitment to make Eastern Visayas an illegal gambling-free region”, Police Regional Director Police Chief Superintendent Elmer Ragadio Soria said, while commending RSOG for the successful police operations. The Regional Director added that that there has been no let up in the campaign against “swertres” even as he reminded ground commanders to intensify their anti-illegal gambling campaign and on the PNP’s “One Strike and No Take Policies”. Suspect Jerry Malinao y Layog, a known coordinator of “swertres” with the gambling paraphernalia who was arrested in an anti-gambling operation conducted RSOG8 at Brgy Crossing, San Isidro Leyte last October 15. Soria identified the arrested suspects as Jerry Malinao y Layog, a resident of Brgy Crossing, San Isidro Leyte who was arrested together with a minor; Armando Banalo Hidalgo, 80, married of Brgy Abgao, Maasin City; Wedan Ponferada y Pestilos of Brgy Liberty, Mayorga, Leyte, Anthony Apura y Apable, a resident of Brgy. Songco, Borongan City and Julie Ramos y Calvario from Brgy. Hindang, Borongan City. Malinao and the minor (name withheld) was arrested about 8:00 o’clock in the evening of October 15 at Brgy Crossing, San Isidro Leyte by joint elements of RSOG8 and Regional Public Safety Battalion 8 (8th RPSB) led by SPO3 Nelson Lapeciros while engaged in collecting bets for illegal numbers game operation locally known as “swertres” from different ushers. The team recovered from his possession and control 118 pieces of Philippine Lotto swertres results; 22 pieces of yellow pad with different number combination and bets with different dates; 14 white bond paper with different number combination and bets with different dates; 15 pads of stubs with different number combinations; black ballpen; and cash bet amounting to P1,035.00 in different denominations. Meanwhile, at about 2:00PM of October 15, joint elements of RSOG 8 led by SPO1 Jonathan Ladrera, 8th RPSB and Maasin Police Station nabbed Hidalgo while collecting bet for “swertres” inside the wet market of Brgy Combado, Maasin City. Recovered from the violator are swertres tip dated October 15, 2012, one booklet stub with different number combinations dated October 15, 2012 and a black ballpen. 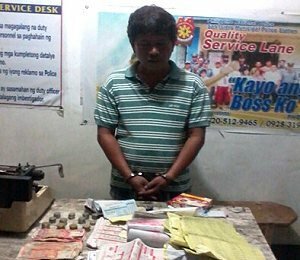 In Mayorga, Leyte, RSOG arrested Ponferrada in Brgy. Liberty while in the act of collecting bet money for swertres. Confiscated from his possession are bet money amounting to P500.00 in different denominations; 10 pieces tally sheets; 1 unit Samsung mobile phone and 1 unit green Honda Wave 125 motorcycle used in his illegal activity. RSOG also conducted anti-illegal gambling operations in Borongan City in Eastern Samar resulting to the arrest of Apura and Ramos who were caught in the act of collecting bets for “swertres” at Brgy. Songco. Recovered from the suspects were illegal numbers paraphernalia composed of 2 booklets of stub containing different number combinations; and cash bet in different denominations amounting to P225.00. The arrested suspects will be facing charges for violations of Presidential Decree 1602 as amended by Republic Act 9287, Soria said, adding that he had given stern warning to Police Chiefs and Provincial Directors that he will not hesitate to order their relief if they would fail in the anti-gambling campaign. PASAY CITY – Involuntary or enforced disappearance is now a crime punishable with life imprisonment after the Senate unanimously approved on Tuesday the bicameral conference committee report on Senate Bill 2817 authored by Senator Chiz Escudero. The senator, who chairs the Committee on Justice and Human Rights and principal author of SBN 2817 or an Act Defining and Penalizing Enforced or Involuntary Disappearance, called the passage of the bill by both houses of Congress very significant for human rights. The bill now awaits the signature of President Benigno Aquino III. “The act of involuntary disappearance is not yet considered a crime under our existing laws. We bear witness to cases of forced disappearances, and more often, these cases are left in oblivion without putting those persons responsible for the commission of the disappearances accountable,” Escudero said. Once enacted into law, perpetrators of involuntary disappearance will be meted the penalty of reclusion perpetua or life sentence which is equivalent to 20 years and one day to 40 years imprisonment. The measure also prohibits the issuances of “orders of battle” – official or otherwise – by the military, police or any law enforcement agency to justify an enforced or involuntary disappearance. Escudero said the bill also provides that prosecution of persons responsible for the commission of enforced disappearance shall not be prescribed unless the victim surfaces alive, in which case the prescription period shall be 25 years starting from the date of reappearance. The bill also mandates the expeditious disposition of habeas corpus and amparo proceedings and immediate compliance with any release order by virtue of such proceedings. “There must be no compromise on strong legislation with effective corrective penal measures, even if it would mean tilting the balance much more in favor of individual rights and human dignity. There should be enough of desaparecidos, because enforced disappearances have emotionally, mentally and physically displaced mothers and fathers, sisters, brothers, children. These disappearances have caused us to be put under the tight watch of local and international rights groups and even foreign governments” the senator said. Within six months after the measure is enacted, all related government agencies are mandated to submit an updated inventory of all officially recognized and controlled detention facilities and the list of detainees under their respective jurisdictions. CAMP RUPERTO KANGLEON, Palo, Leyte – PNP PRO 8 is strictly enforcing compliance for all its personnel with the use of standard protective motorcycle helmets while driving. In line with the implementation of R.A. 10054, an act mandating all motorcycle riders to wear standard helmet gears when driving, PNP PRO 8 in coordination with the Department of Trade and Industry (DTI) conducted a helmet stick marking for free at the PRO 8 Grandstand today, October 17, 2012. Over One Hundred Sixty Two (165) helmets were validated and issued ICC stickers from One Hundred Six (106) personnel by the DTI representatives. DTI Regional Director Cynthia Nierras stresses that helmet stick marking is free of charge. “All you have to do is to come to our office and bring with you your helmets for inspection/evaluation, your official receipt/certificate of registration, and fill out the application form,” Nierras said. Attorney Lemuel R. Montes, OIC, DTI Consumer Welfare Division explains that under the said law, all motorcycle drivers and back riders are required to wear at all times standard protective motorcycle helmets while driving whether long or short drives and in any type of road or highway. On the other hand, sellers and/or dealers are required to sell or offer for sale only certified helmets that have passed through product testing and have complied with the specifications issued by DTI and with PS or ICC marks. Selling of uncertified helmets constitutes a violation and is a punishable offense, says Mr. Irlando D. Tuazon, Senior Trade and Industry Specialist. Motor vehicle dealers are also advised to have available standard motorcycle helmets so that in every purchase of motorcycle unit, the customer may have the option to buy a certified helmet from them. Administrative sanctions of the Act include, among others: any person caught not wearing the standard protective motorcycle helmet shall be punished with a fine of P1,500 for the first offense; P3,000 for the second offense; P5,000 for the 3rd offense and P10,000 plus confiscation of driver’s license for the 4th and succeeding offenses. 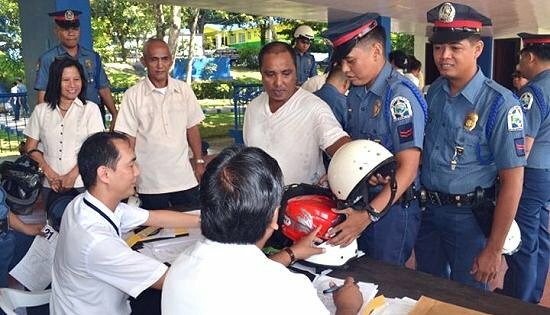 DTI is very strict with the standards because, “if any accident happens, most of the time the only thing that can save your life is a helmet which is not substandard, because if it is not, there is no guarantee that your head will be protected from a fall”, PRO 8 Regional Director PCSupt Elmer Ragadio Soria added. The Helmet law is set to be fully implemented on January 1, 2013. GOVERNMENT CENTER, Palo, Leyte – The Civil Service Commission has revised the service requirement for the grant of Barangay Official Eligibility (BOE). This was learned from the CSC Field Office 8 Director Marilyn Taldo who said that the granting of the eligibility will now be based on completion of term of office. Barangay officials who complete their term of office may now be granted civil service eligibility. Previously, barangay officials may apply for the said eligibility only after completing five years of aggregate service, Director Taldo said. Director Taldo said that the CSC Board reviewed and revised the rules in the light of instances where barangay officials are unable to avail of the BOE despite completion of term because they did not meet the five-year service requirement. The BOE which is granted without taking the career service examination, is comparable to Career Service Sub-professional Eligibility. Those with BOE can be appointed to first level positions in the government that do not involve practice of profession and are not covered by BAR, board, and other special laws. First level positions refer to clerical, trades, crafts, and custodial service positions that involve non-professional or sub-professional work requiring less than four years of college studies. In accordance with Republic Act No. 7160 or the Local Government Code of 1991, the BOE is granted to elective barangay officials composed of the barangay chairman or punong barangay, regular Sangguniang Barangay member or barangay kagawad, and Sangguniang Kabataan chairman. It is also granted to appointive barangay officials, namely, barangay treasurer and barangay secretary who are appointed by the duly elected barangay chairman. All barangay officials who have completed their term of office before August 1, 2012 have until August 1, 2014 to apply for the BOE. On the other hand, it will continue to process applications for BOE for those who have completed their term of office on August 1, 2012 and thereafter. Barangay officials applying for BOE must submit an application form and other documentary requirements to the CSC Regional or Field Office having jurisdiction over the barangay where they have rendered services. Interested parties may visit the CSC Office nearest them for more information on the grant of BOE. MANILA – Unabated approvals of genetically-modified crops threaten – not enhance – food security, Greenpeace warned at today’s observance of World Food Day. The environment group is calling on the Department of Agriculture to safeguard the country’s food security by banning genetically-modified organisms (GMOs) which promote agricultural monopoly by giant agro-chemical corporations – aside from causing harm to human health and the environment. Among all of Southeast Asia, the Philippines has approved the most number of GMOs. Since December 2004, at a rate of almost one GMO every 1.5 months, the country has approved a total of 67 GMO crops, for food, feed and processing, propagation, and field trial. No GMO application in the Philippines has ever been disapproved despite documented cases on questions of their safety and rejection by other countries. In fact, some GMO crop varieties, such as GMO corn, that are actually banned in other countries due to health concerns, are allowed in the Philippines. Significantly, the government's system of regulation and assessment of the safety of GMOs remains closed to the public. Pro-GMO lobby groups and policy makers have cited hunger alleviation to justify GMO approvals. However, a recent UN Food and Agriculture Organization report stated that there are 5.4% more hungry people in the Philippines now, compared to the previous decade – even as hunger substantially decreased in the same period in all other countries in Southeast Asia – majority of which do not plant GMO crops. For example, the number of chronically hungry people decreased most dramatically Thailand (79.8%), a country which does not plant GMOs. Technological solutions presented as silver bullets to solve hunger, such as GMOs, shift the focus away from the real solutions and hide the true causes of hunger which derive from social and environmental problems. Greenpeace says that the government must acknowledge that a large part of the problem is giant agro-chemical corporations which are hell bent on marketing GMOs and the industrial farming system it maintains, with little regard to health, environmental, and economic consequences. Fundamental changes in farming practices are needed in order to address soaring food prices, hunger, social inequities and environmental harm. But while the DA has taken the first step toward this solution through the Organic Agriculture Act of 2010, this effort continues to be undermined by continued approvals of GMOs, as well as support of commercial research to propagate these harmful modified crops. “GMOs do not play a substantial role in addressing the key problems hunger and poverty, and food safety and security. The government’s rabid support of GMOs is completely irresponsible because it supports industrial farming practices and chemical dependence that would endanger, rather than improve, the country’s agricultural sector. By approving GMOs, the government is actually compounding the food problem, not solving it,” said Ocampo. “The government must reexamine their misplaced focus on industrial farming which has diverted government funds from supporting ecological solutions that ensure food security and sound environment. As a start, the DA must cancel all GMO approvals and instead support ecological alternatives that will guarantee a healthy, viable and sustainable agriculture to feed the country,” he concluded. MANILA – Vice President Jejomar C. Binay said the landmark 100th person convicted for human trafficking underscores the Aquino administration's determination to eradicate trafficking in the country. Binay, chairman emeritus of Inter-Agency Council Against Trafficking (IACAT), said the government’s anti-human trafficking campaign is expected to receive a big boost once Senate Bill No. 2625, or the Expanded Anti-Trafficking in Persons Act, is signed into law. “To date, there have been 100 persons convicted since 2005, with 70 of those under President Noynoy Aquino’s administration. With stronger anti-trafficking laws in place, it will be much easier for us to file more cases and secure more convictions” he said. He added that for 2012 alone, the IACAT has been able to secure convictions for 28 persons in 17 human trafficking cases. The anti-trafficking czar lauded the Senate for unanimously approving the measure on its third and final reading. The Vice President also said with the new law in place, it would be easier for the Philippines to attain Tier 1 classification in the United States’ Global Trafficking in Persons Report. The annual report of the United States Department of State classifies countries into tiers depending on their compliance to the U.S. Trafficking in Persons Protection Act. “I am thankful that the Senate fully supports our campaign against human trafficking. The enactment of the Expanded Anti-Trafficking in Persons Act would mean greater protection for our kababayans, especially the women, children and our Overseas Filipino Workers (OFWs),” he added. Voting 19-0, the Senate passed earlier this week the bill that seeks to strengthen the government’s fight against human trafficking. The Vice President, who is also the Presidential Adviser on OFW Concerns, commended particularly the inclusion of the crime of attempted trafficking in the proposed law. He said it will allow the government to become pro-active rather than reactive in eliminating human trafficking cases and prevent OFWs from being abused. “The current law only allows us to file trafficking charges against perpetrators only after the actual act had been committed. Because of this, our kababayans had to be subjected to abuse first before trafficking charges could be filed,” Binay said. Binay cited the cases of trafficking of OFWs, saying that if the OFWs were not yet transported abroad, only illegal recruitment charges could be filed against their recruiters. “Just last month, the Zamboanga Sea-Based Anti-Trafficking Task Force (ZSBATTF) off-loaded 40 would-be victims of human trafficking bound for Malaysia,” he said. “Illegal recruitment has a significantly lesser punishment compared to human trafficking violations. With the inclusion of attempted trafficking, trafficking charges could be filed against those recruiters with our OFWs not being subjected to abuse,” he said. Violators of attempted trafficking would be facing a penalty of 15 years of imprisonment and a fine ranging from P500,000 to P1 million. Trafficking persons currently carry a penalty of 20 years imprisonment and a P1 million fine, while qualified human trafficking violators face life imprisonment and a P2 million fine. Binay also lauded the plan to remove the confidentiality clause in R.A. 9208 that prohibits the disclosure of the name and personal circumstances of trafficking suspects. The current law bans the disclosure of any details that could lead to the identification of both victim and suspect. Under Senate Bill No. 2625, the identity of victims of human trafficking will remain private, while information on persons accused of human trafficking will now be made public to warn possible victims. “The lifting of the confidentiality provision for human trafficking suspects would greatly help in deterring human trafficking acts because we can now warn the public of persons who might victimize them,” the Vice President said. CAMP SEC. RUPERTO K. KANGLEON, Palo, Leyte – Police Regional Office 8 (PRO8) Regional Director Police Chief Superintendent Elmer Ragadio Soria recognizes the important role of “force multipliers” in addressing the peace and order situation in their respective communities. “My vision is for a more aggressive and stronger partnership between the police and the force multipliers in our drive against criminality as you play a crucial role in crime prevention and control operations.”, Soria addressed the 200 delegates during the 2nd Annual Regional Grand Assembly of the “Peace, Action and Rescue with Dedication to Serve the Society (PARDSS) anti-crime group held at the PRO8 Matapat Hall, Friday afternoon. 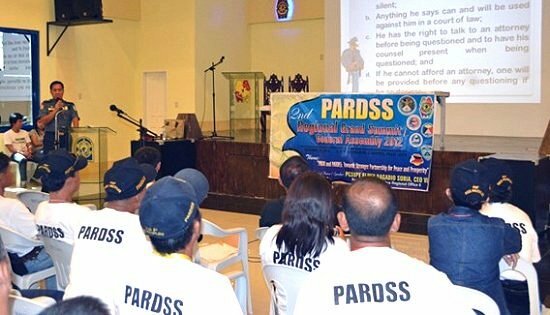 PARDSS is a PNP-accredited non-governmental organization with the prime mission of helping the PNP and the local government units in promoting peace, unity, public safety and development. It was awarded as the “Best Non-Government Organization for 2011” during the 111th Police Service Anniversary last August 8 at the PNP National Headquarters by PNP Chief Police Director General Nicanor Ancheta Bartolome. During the summit, the PNP regional director underscored the crucial role of the force multipliers in crime prevention and control operations at the community levels. Soria admitted that the police may not be able to cover every nook and cranny of the country in patrol operations considering the limited number of PNP personnel. In order to address these deficiencies, the PNP adopted a proactive strategy that will maximize and encourage community involvement and fully harness and promote community partnership as the ideal, most practical and mutually beneficial antidote to criminality and maintenance of peace and order. “There is an impending need to activate force multipliers from the community and established an effective community machinery policing system through community partnership”, Soria further averred, adding that PRO-8 recognizes the major role of active partners like PARRDS in keeping Eastern Visayas peaceful. “The community relies upon the police for protection and the police rely upon the community for support. Crime is everybody’s concern and public safety is a shared responsibility”, the region’s top police official added. Soria particularly expect members of said organization to perform such functions as partners in law enforcement like conducting street crime monitoring; community organization; disaster management and relief and rescue activities; crowd control; environmental protection and conflict resolution at the community level. “We are confident that we can rely on you to be the eyes and ears of our crime reporting system as a critical component of the Police Integrated Patrol System or PIPS that PRO8 is religiously implementing.”, he added. Since 2006, the PARDSS, with thousands of active members scattered throughout the country, has performed well in giving free assistance to the local policemen and local government units in its anti-crime drives, crime monitoring and securing peace and order. The organization is an active member of the PNP-Federation of Accredited NGOs (PNPFAN), Alliance of Concerned PNP Accredited NGOs (ACPAN) under the supervision of the PNP’s Police Community Relations Group (PCRG) and partner of the Association of Chiefs of Police of the Philippines (ACPPI).